I grab my camera, still sticky from my last visit to the hives, and take it outside. I gather my supplies and place them behind the hives. It's around noon on a July day in the south and the temperature and humidity combined are suffocating. I'm wearing shorts and a tee shirt with flip flops as I walk behind the hives and arrange my equipment. The bees are busy bursting from the front of the hive to forage and dive bombing back in to the entrance. They take no notice of me. They are on a mission for their sisters. Finding what is needed to keep the colony fed. I gather some pine bark from the yard and tiny twigs. I put them in my smoker with bits of paper and scoop up some pine straw. I go to the porch to get my suit on. I enclose myself inside and check all the zippers except the hood. I put on socks and boots and return to where I left the smoker. I light it and puff to get the flames going. I am building a small fire in a tin can. I add a few more twigs to the fire and puff. Flames shoot up above the can. Smoke gets in my eyes. It always does. I add the pine straw to the can and puff. Flames die down and eventually I can close the lid so the cool smoke comes out the end of the spout and I can direct it. I zip the hood on my suit, put on my leather gloves, and head to the hives. 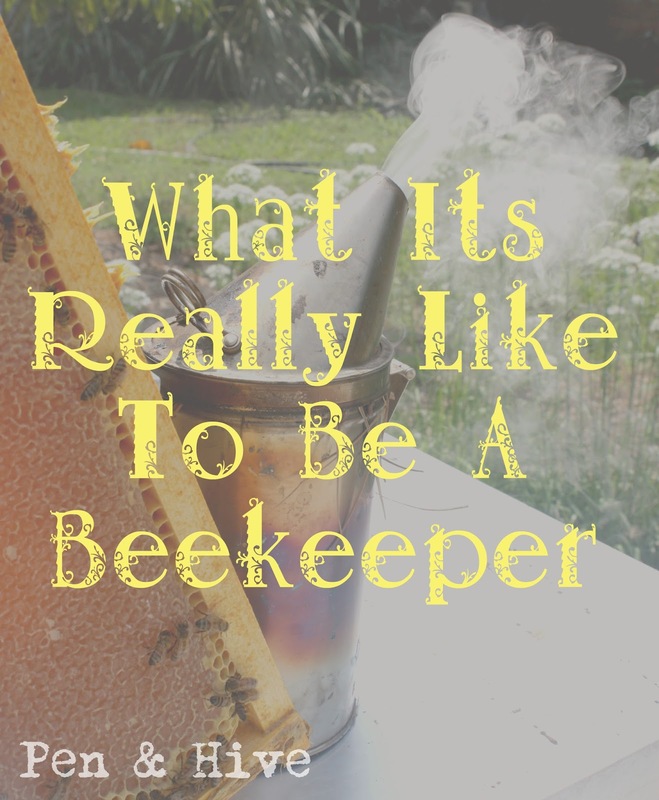 I puff a bit of smoke at the entrance then go around to the back (you always want to work bees from the back of the hive for obvious reasons) use my hive tool to pop loose the outer cover. I lift it a couple of inches and puff more smoke into the hive. A hum arises from inside. I take off the outer cover and then pry loose the inner cover after adding a bit more smoke. Now I can see inside the hive. There are many bees. A few fly out and around but mostly they ignore me and go on about their business. I am always astounded by their single mindedness. Using my hive tool as a mini crowbar I lift a frame out of the hive. This is the top box or honey super. In it the bees are making the honey that I will harvest when they finish. There is comb that is built out. along the center there is wet honey. At the corner some beautiful capped honey. White and pristine. I return the frame so as not to disturb them any more and use my hive too to pry the super loose from the brood box. Everything must be pried apart, sometimes with great force. The bees make a substance called propolis from tree resins and gums. They use this to seal every crack, reduce vibrations, and occasionally mummify something that enters the hive that is too big for them to remove, such as a lizard or mouse. Propolis is very important for the hygiene of the hive. It is also very strong. When they get bored they glue everything together. In the spring when I do the first inspection after winter there is much prying and pulling. Sometimes I think I'll never get it all apart. They've had all winter to seal up every nook and cranny to keep out icy drafts. But today in the July heat the propolis is soft and sticky having been melted under a Tennessee sun. I am looking for certain things. I am looking for brood comb and larvae. I would be looking for eggs as well but I can't see anything so small without my readers and inside the suit it's too much to deal with. Capped brood and larvae let me know that I have a laying queen. More specifically that I had a laying queen just a few days ago. Having a queen that is laying eggs is the most important thing I'm looking for. No queen, or a weak one that isn't laying, means the colony will weaken and eventually die. I am happy to see several frames of capped brood. It is brown and smooth. I spy a small hive beetle scurrying across the edge of the box and crush it with my hive tool. I don't see any more so it appears that the problem isn't out of hand. The possibility of a small hive beetle infestation strikes fear in the heart of every beekeeper. They can destroy a hive and ruin an entire season of honey. I don't see any more. I move slowly and deliberately. Bee eyesight is keen to see jerky rapid movement. They know I'm here but being calm and working carefully help keep the bees docile. If they get noisy or if guard bees line up on a frame and look at me, I add a bit more smoke and continue. On this day all is well so I I don't need to do anything. They still have plenty of frames to fill out with comb. Nothing seems amiss. I leave this frame out so I can photograph it. I fumble with my camera through my sticky leather gloves. I press it against my bee veil so I can get it close enough to my eye to focus it. The sweat from my face gets on the mesh. I can tell that my clothes under the suit are soaked. While working I have felt sweat dripping down my back. I take several photographs. I will blow them up later on my computer to check for varroa mites, another pest beekeepers deal with. It is a parasite living on the bees but is visible to the naked eye. I pull out the tray of the hive beetle trap to check it. Lots of dead beetles as well as a few moths and bees floating in the oil. It's working to keep the beetles under control. I finish taking pictures and put everything back the way I found it. I leave my tools and camera because I'm in a hurry to get out of the suit that is now like wearing a personal sauna. On the back porch I peel off my boots and drenched socks and suit. I smell like a campfire, honey. and sweat. I drink some water and watch as the bees return to their activities as if nothing has happened. I get more water and return to the hive to collect my tools and camera. Then it's time for a shower and logging notes in my bee journal. I'll go about my business and the bees will go about theirs until I visit them again. Urgh, feel bad for you having to deal with the small hive beetle. Thanks for stopping by, Emily! SHB are by far the biggest problem beekeepers in my area of the US face. I've been able to keep them under control but they are wretched little creatures!